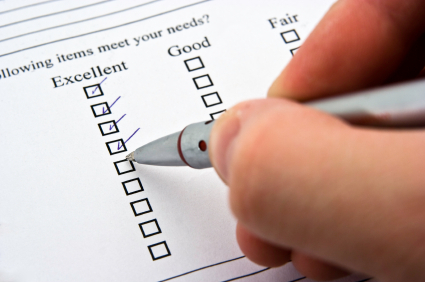 Traditional methods of getting feedback from customers make it difficult for the customer and easy for the supplier. If the customer is absolutely determined to give good or bad feedback, they will fill in the form or call the call centre and find a way to let you know how they feel. But what about the high percentage of customers who simply walk away without telling you they are unhappy? What about the vast majority of people who can’t be bothered? What about those who feel their feedback isn’t welcome because it’s outside of their “normal” interaction with your company? And I would add to that, “almost no one visits a website to fill in a 15 page long survey” and certainly “almost no one stays in your hotel, flies with your airline, uses your service or buys your products in the hope that they will get to complete a mammoth feedback form afterwards”. It strikes me that it’s high time we extended Seth Godin’s concept of permission marketing to customer feedback. We’re going to coin a phrase: permission feedback. Permission Marketing encourages consumers to participate in a long-term, interactive marketing campaign in which they are rewarded in some way for paying attention to increasingly relevant messages… Permission marketing is anticipated, personal, relevant. Anticipated-people look forward to hearing from you. Personal-the messages are directly related to the individual. Relevant-the marketing is about something the prospect is interested in. So marketing is starting to interact with customers in this new way. They have stopped “interrupting” customers and instead seek out a time and place convenient to the customer to have a marketing conversation. And yet we don’t extend this level of courtesy to our very best customers! Potential new customers are courted, asked permission, opted in. And yet people who just bought our service or used our product are interrupted in their day-to-day interactions with us by paper forms and 15 minute long web surveys – usually to enable the vendor to target more people like us! A straw poll amongst friends bears this out entirely. For example – a friend and her husband who flew with a major UK holiday carrier. They had a horrendous experience and were then handed a lengthy paper questionnaire which started off with a bunch of marketing questions like “how much do you earn?” and “what do you read?” on the plane home. Needless to say she didn’t complete the form. My friend swore to me she would never travel with them again. I know my friend is unhappy. So do at least 4 more of her friends. Does the carrier know? They haven’t a clue. The pop-up customer survey on the website – an interruption – I only just got here and I want to buy some groceries. I don’t even know whether I like your service or your site yet! The paper questionnaire on the bed of the hotel room before you check out – an interruption – I’m in the middle of trying to grab breakfast, pack my case and finish my email, I don’t have time for this now! The annual satisfaction review – an interruption – I’ve got 3 projects to finish before the end of the week, and I know you’ll want an hour of my time. Can we reschedule? As customers, we are typically happy to provide feedback, but only when it suits us to do so. How much better to proactively and regularly contact a customer to say “How was it for you?”. Isn’t that what you really want to know? Make it quick. Make it simple. Make it painless. Find out where the major service issues are. And then follow up where it wasn’t great to fix it at a time convenient to the complainant. That’s exactly what our new service, Customer Thermometer will do. It’s the first tool focused on enabling permission feedback. Honestly, I don’t really think permission marketing is anything new. It’s been in China for 5,000 years! If we really focus on the benefits of our customers instead of our own bottom line performance, we’d care how they feel, and we don’t even need this permission marketing thing. We won’t just go and sell without earning the right to advance. Thanks for your views Daryl. I appreciate them. Whilst it’s not new, it’s woefully lacking in the operation of most organisations. I’d say that the examples I’ve cited of customers being “interrupted” in their day to day dealings with businesses are still the rule rather than the exception. Only this morning I got sent a 3 page paper questionnaire in the mail from the company who service my car. How’s that for disregarding the importance of my time?! Statistics show that most dissatisfied customers won’t bother giving feedback because it’s too much hassle for them. Instead they will just walk away – we have created a simple monitoring system that alerts you to unhappy (and delighted!) customers.